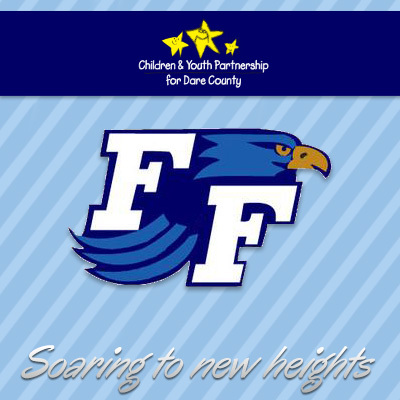 First Flight High School is an exciting and enjoyable place to learn and grow. The dedicated faculty and staff are committed to preparing all of our students for the 21st Century. We continue to work in partnership with families and the community in providing our students with the very best high school experience possible. Our goal at FFHS is to provide rigorous and relevant academic opportunities for all of our students in a caring and nurturing environment. Through the use of cutting-edge technology and proven best instructional practices, our students and staff combine real world applications with complex and multifaceted challenges to develop skills that will equip our students for success in a rapidly changing global economy. Although FFHS is a new school having only completed its fifth year, we continue to be recognized as a high performing North Carolina high school. Our students showed growth on the NC ABCs program, and FFHS was named a School of Distinction. Over eighty-four percent of FFHS students are engaged in Advanced Placement and Honors courses during their high school experience. We are proud of our accomplishments, and we look forward to the future as we continue to stretch ourselves and our students to learn new things and reach new heights. We at FFHS are excited about the challenges that lie ahead as we work together to prepare all of our students for the future. We thank our students, parents and community for their continued support and involvement in this challenging and exciting endeavor. Go Nighthawks!